Pond's Acne Clear - 3 day challenge! Acne is one of the most horrible things that can happen to our skin. But when puberty hits and we all have our fair share of daily stress, pollution and fickle weather, our skin pores get clogged by excess oil and dead skin cells, allowing bacteria to flourish. Before you know it, you have different types of bumps on your skin, better known as acne. But as modern life continues to evolve, the factors attributed to common skin conditions like acne are also becoming more complex. Pond's formulated an innovation for the new Pond's Acne Clear product range, as it is now formulated with Active Thymo- T Essence. This Lock + Clear technology in the new Pond's Acne Clear is the first in the world to lock powerful acne-fighting Active Thymo-T Essence, which penetrates deep inside bacteria cells to clear acne from the root and preventing it from coming back. Women usually settle for just mere soap to wash their faces and try to cure acne. However, regular soap only cleanses the top layer of skin, without going deeper to solve the root cause of modern acne and can even cause more harm to the skin. First step - Cleanse away the excess oil and dirt with the Acne Clear Facial Foam. It's so gentle that it doesn't get rid of the natural oils so your skin won't be dry and dull after. Just put a pea sized amount on your hands, rub them together, and lather it on your face using a circular motion. Focus on acne-prone areas, then wash it away. Second step - Treat your pimples with the Leave-On Clearing Gel. Put a tiny amount on your fingertips then lightly apply on the affected areas. It's perfect because gel is easily absorbed on the skin so it acts instantly! This product is suitable for mild-to-moderate acne including whiteheads, blackheads and pimples. I, myself have personally experienced a big breakout on my skin lately. Last term's school work really took a toll on my skin, because of all the thesis, late night sleeping and just so much stress. :( I don't usually get a lot of pimples, but this time, they came all at once! Huhuhu! So, I gave the Pond's Acne Clear regimen a try! Here's a 5 minute video of my 3-day experience! My first reaction with the Pond's Acne Clear was that, wow! It smells really good! Even after 30 minutes of washing my face, I can still smell it. :) The after effects of both products are really cool on the face and actually feels refreshing! So, how about you, guys? Why not try the #PondsAcneClearChallenge like I did? 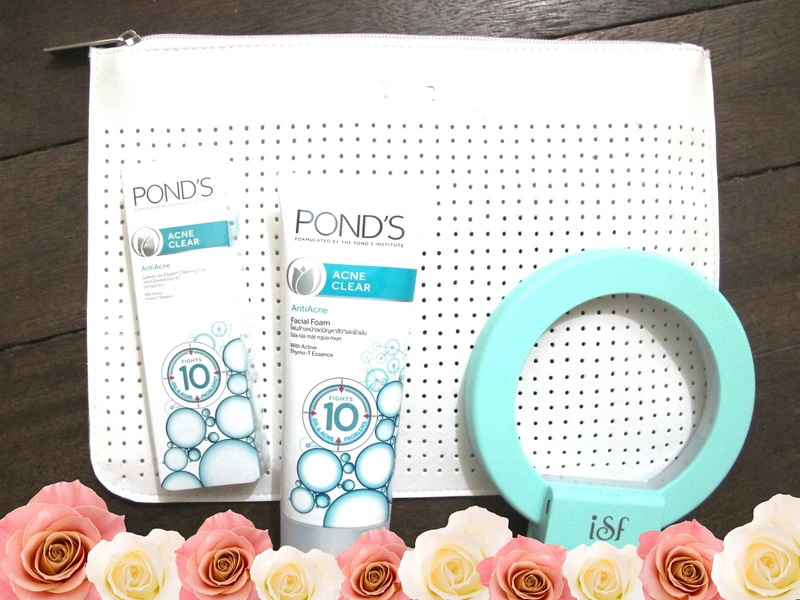 You can even win yourself a Pond's Acne Clear Selfie Kit! :) Join in now! The new Pond's Acne Clear Facial Foam and Leave-On Expert Clearing Gel are now available at all leading drugstores, supermarkets and department stores. Pwede ba yan 2x a day? Pond r available in Pakistan??? Twice a day po ba? Gumagamit po ako ng ponds facial foam and cleansing gel twice a day. Kunti lang pimples ko pero dumami sya at naglitawan yung iba pero pumuti mukha ko pero dumami pimples. Bakit po ganon? These products are so great! I just have one question, what product is the best for dark spots? Thank you. Is it safe to buy these products for a 10 year old? Is it safe to buy Ponds Pimple Clear and Gel for an 11 year old? Is it still effective kung facial foam lng ang gagamitin? Twice a day po ba siya? Or before going to bed lang talaga? what is the best time to use the acne clear facial foam and the leave on gel?